When police officers arrest someone, they often intentionally or unintentionally label that person as a deviant individual. Being labeled as a “bad guy” can actually perpetuate a person’s negative behavior, therefore, it’s important for police officers to recognize and understand the impacts of labeling theory. Labeling theory is based on the idea that behaviors are deviant only when society labels them as such. Within criminology studies, labeling theorists argue that no act is itself deviant, but rather deviance is a social construct. Labeling theorists believe that such a deviant label can lead to a self-fulfilling prophecy and such a negative social stereotype can doom the labeled person to continue acting deviant. Many officers have witnessed or participated in labeling and may not realize that this “name tagging” influences our perceptions about another person’s social status. For officers, labeling a person with the department’s “nickname” for criminals is to mark that person as a deviant, regardless of whether a criminal act occurred or not. Such labeling could happen due to anything from the neighborhood the person lives in to their assumed associates. The police culture’s use of tagging influences how other officers behave when they have future contact with this labeled person. Labeling a person is the equivalent of a police “No Fly List” because police culture dictates that the labeled individual should be treated differently because they have been identified as trouble. Labeling leads to stereotyping or profiling which can cause poor decision making by officers. Labeling a person might actually have the opposite affect than law enforcement intended. They may have initially labeled a person in order to shame them or to establish territorial authority. Labeling has been shown to cause self-esteem issues and stigmas. A stigma is a powerfully negative label that—when internalized—can change a person’s self-perception and possibly their social identity. This can often negatively affect their standing in the community as well. 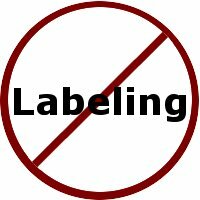 Labeling can cause the person to actually live up to the negative label, when in fact, they might not have continued with deviant behaviors had they not been forced in that direction by the societal effects of labeling. Understanding the possible effects that labeling can cause is the first step to helping change this misguided practice. Some patrol traditions and bad habits need to fade away so that officers can make positive relationships with the citizens they serve. Changing the way officers communicate within their communities starts with changing how officers communicate within their ranks. Being an ethical warrior means doing the right thing even when no one is watching. It also means leading by example and role modeling positive behavior to new officers who learn police norms by watching seasoned veterans. Giving respect is the only way to earn respect! Posted in Mark's Articles and tagged Corrections, Crime, Crime Analyst, Crime Scene, Criminal Intelligence, Criminal Justice, Criminology, K-9, Military Crime, Police, Sheriff. Bookmark the permalink.